On March 23rd, the Delta Gamma chapter at Ole Miss celebrated their 50th anniversary, a huge milestone for any chapter. When F. Harrison “Buzz” Green, Ole Miss ’66, returns home to Oxford, OH, from his trip to Mississippi, he makes a stop at the Executive Offices to tell us about it. Now the Vice Chairman on the Foundation Board of Trustees, Buzz has been an active member since he became a founding father of the Delta Gamma chapter. When Phi Tau arrived at Ole Miss in the fall of ’66 they were called “The Group” because the University would not give them permission to use Greek letters. “The Group” spent a year fighting to prove to University faculty that there was a need for another Fraternity on campus. They were finally successful by the end of the academic year, when they were given permission to call themselves a Greek organization. It took another year from there to charter, which they did in the spring semester of 1969. As a colony, Delta Gamma purchased a chapter house they paid off in just 7 years. Buzz details some of the cost cutting measures they took to do this - the house would charge for 20 meals a week, he explains, but they would only get nine, and that ninth one would just be a peanut butter sandwich. They also did not have a big budget for social events. They wanted to have an open party - a big part of the Ole Miss social scene - but they did not have the funds to go all in. Instead, they hired a local high school band director. Expecting him to show up with a quartet, he brought a 35 member band and the party was a success. Today, our Ole Miss chapter is 92 men strong. These undergraduates rallied together, with the help of their house mother, to put together a weekend-long celebration. It began on Friday with a reception at the Delta Gamma house, a newer one purchased in 1984. Phi Tau members and their guests were able to tour the property and see the way it has changed over the years. Saturday during the day the group met to discuss the future of the fraternity with the alumni. Saturday evening was the gala at the Oxford, MS, country club. There were 525 guests in attendance - when I expressed surprise at such high attendance, Buzz grins and says, “We’re loyal Phi Taus.” In addition to a band and food, there was a silent auction to raise money for a new deck on the chapter house. They auctioned off signed baseballs and jerseys, as well as Ole Miss items. One of the alumni in attendance agreed to match all donations up to $100,000, which he did. 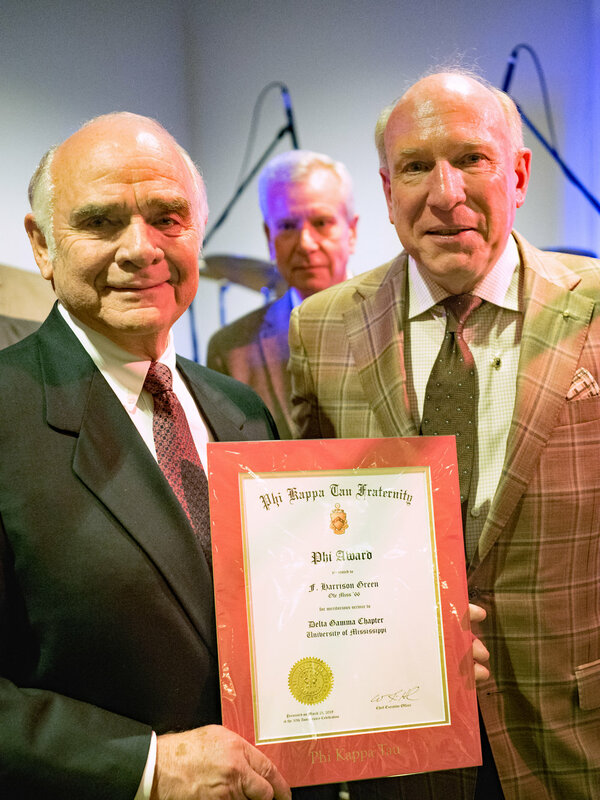 Several alumni received recognition awards, including a Phi award to Gary Thrash, Ole Miss ’69. One of the most special gifts of the night were several framed hand-painted photos of that original house, the one the founding fathers fought so hard to buy and pay off. Buzz, among several other people, received one of these special paintings. Congratulations to the Delta Gamma chapter for such a huge accomplishment!